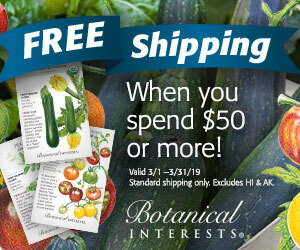 How many of you have wait-and-see plants in your garden? You know, when you look at a plant in spring and think What the heck is that? Did I plant it, or is it a weed? I guess I’ll just wait and see. 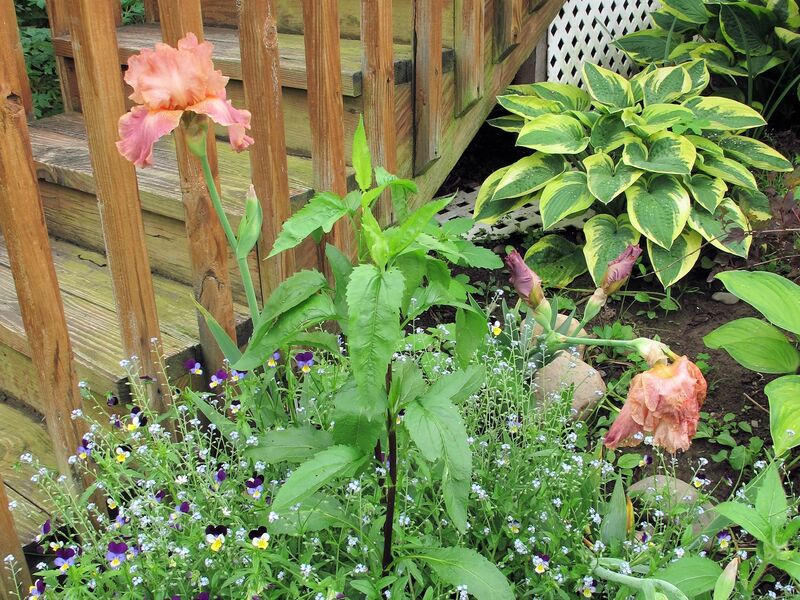 Last fall, I planted a bunch of small plants in the Deck Alcove bed that I had started from seed. Of course the tags got scattered to the four winds, or became illegible. 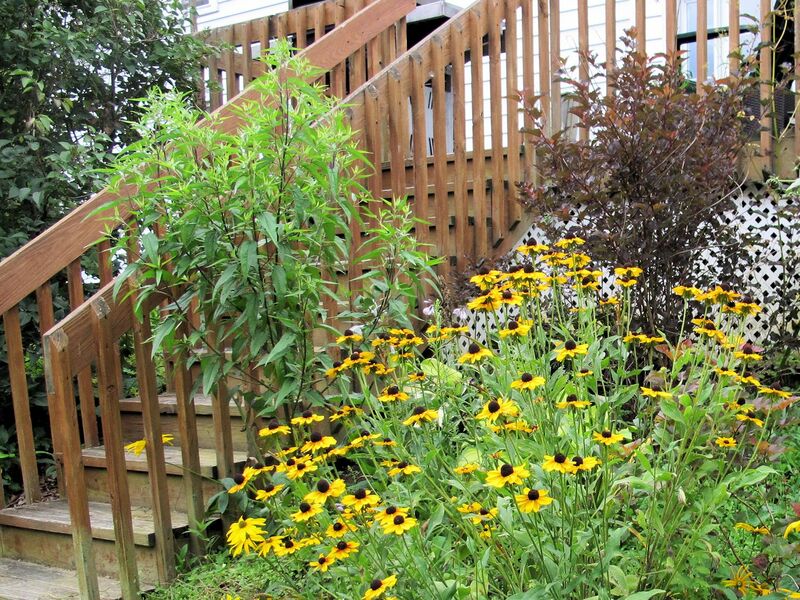 Most of them I knew were rudbeckias of one sort or another, but there was one plant that was different. I thought maybe it was an echinacea. Here’s what my wait-and-see plant looked like in June. By August, I was having doubts about its being a coneflower. For one thing, it was getting pretty big. 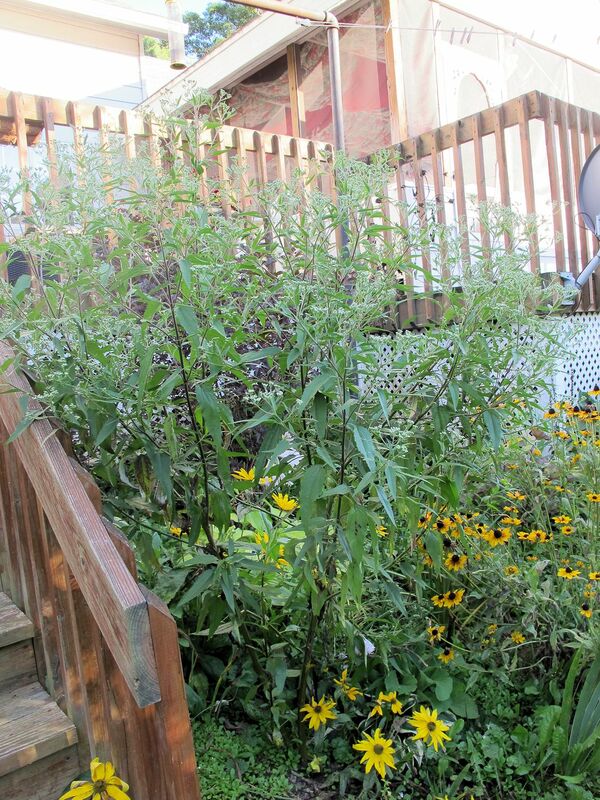 The mystery plant was getting pretty tall for a coneflower. At least, bigger than the other coneflowers in my garden. And it wasn’t making coneflowers–not even coneflower-looking buds–and my other coneflowers were blooming. By early September, it was making buds, and I knew it wasn’t a coneflower. In early September I still didn’t know what it was, though I could see buds forming. I started keeping my eyes open, and did a little research. When it finally bloomed on September 23rd, I knew it for what it was: white snakeroot (Ageratina altissima, formerly Eupatorium rugosum). After this post was published, Gail of Clay and Limestone gently inquired if this plant might not be Late Boneset (Eupatorium serontinum). After a lot of researching on the internet (of course my field guide is currently loaned to someone), I concluded she was right. The rest of this post is edited to reflect that correction. Finally, it started blooming in late September. White snakeroot has a rather sordid history. It’s a pretty poisonous plant. When animals eat it, it can slowly kill them, and in the meantime it poisons their meat and milk. If humans eat that contaminated meat or milk, they can in turn be poisoned and die. People were said to die of milk sickness when this happened, and scholars suspect that this is what killed Abraham Lincoln’s mother. 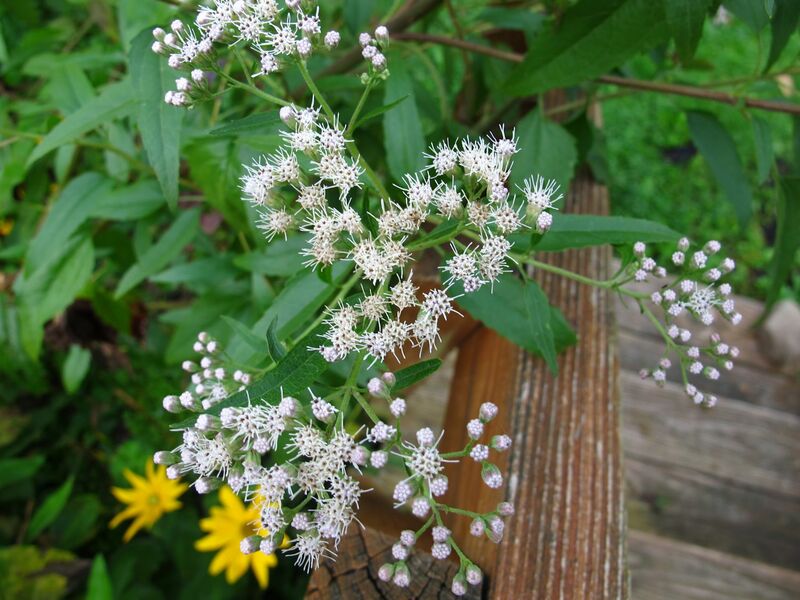 Read more about the poisonous effects of white snakeroot here. But happily, this plant is not white snakeroot, but rather late boneset. The individual flowers are small, but taken together they give the effect of baby’s breath on stilts. 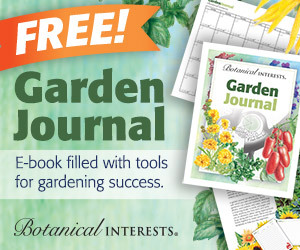 After Gail sent me her private message, I looked again at a lot of websites, including the one I originally used to make my identification, GoBotany. One thing GoBotany doesn’t state (or at least I can’t find it) is the height of the plant. However, Illinois Wildflowers describes late boneset as 3 to 6 feet tall and white snakeroot as 1 1/2 to 3 feet tall. 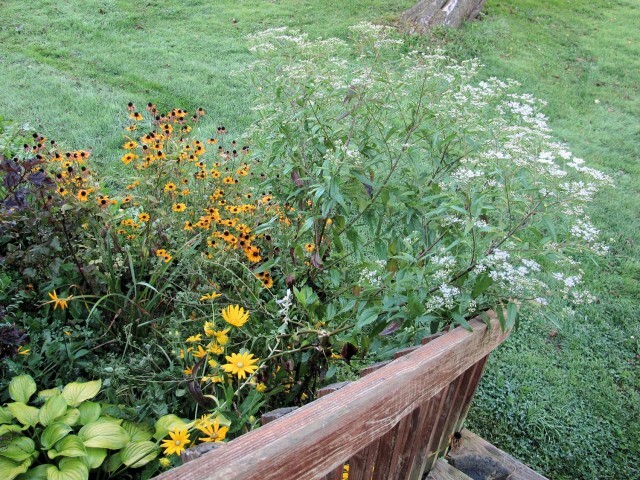 My plant more closely matches late boneset in height. And while Illinois Wildflowers describes the flowers of white snakeroot as “brilliant white”, the flowers on my plant are much more like the “grayish-lavender” that Missouri Plants uses to describe late boneset flowers. In addition, the leaves of white snakeroot are much wider at the base than those of late boneset. I’m thinking this plant would look better at the back of the border, next to the Coppertina ninebark, but I’m wondering if moving it would kill it. I’m also wondering if maybe that would be a good thing, seeing as there is a dairy farm about a mile down the road. I’m sure they don’t want it growing in their pastures. I’m glad I don’t have to worry about this plant being poisonous, now that I know what it really is. Most sources describe it as weedy but don’t go so far as calling it invasive. However it is rhizomatous, forming colonies, so perhaps it would take over if I kept it in the deck alcove, which isn’t a big space, being surrounded on three sides by the deck. What do you think? Should it move to the back of the bed, or be banished forever? Nadia says it is well-behaved for her, so I think I will move it next spring, because I want to enjoy the flowers and I’ve got another garden project that’s consuming my time right now. Been there, done that. Many of my coolest seedlings have turned out to be common weeds, far less impressive than your boneset! I’d lean towards getting rid of it although I have plenty of poisonous plants around. Well, then – in light of the new info, I would probably move it away from the porch railing – it is quite pretty though, so I’m glad you get to enjoy it without a qualm! I like your idea to locate it near the ninebark…should be a pretty contrast. I think my feeling would be…if it survives the move, then it was meant to be. Good luck! I have grown this plant for 10 years. It is not invasive here in Texas hill country, slowly increasing in size at the same site planted. I have discovered no seedlings and I do not deadhead. It is a butterfly magnet. I have pruned it numerous times, no gloves, and with no ill effects. 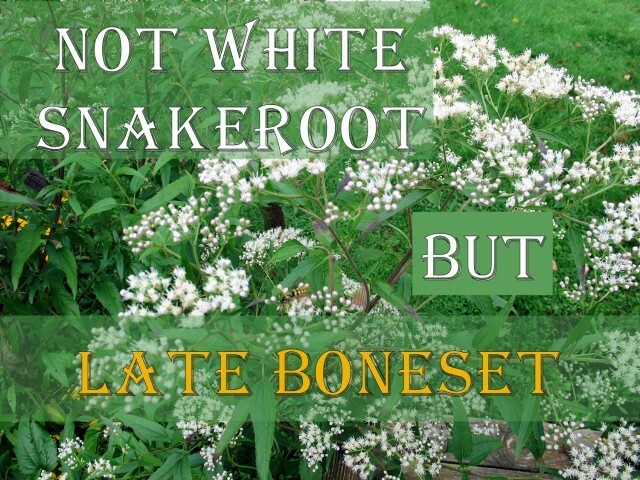 White Snakeroot is also known as Boneset. I believe its leaves applied as a poultice were once thought to aid in the healing of broken bones. If I were keeping it, I would move it – where it is now, people will come into more contact with it. I would probably do it in though – wouldn’t want to be responsible for spreading a potentially lethal plant around. I would move it. I would also just be careful not to let it form seed but then your frosts come earl and may prevent that anyway. Oh, and get your mik just a bit further afield. Wow, Kathy, you are a paragon of patience to have waited it out until the plant gave you enough hints that you could ID it. Did it come from one of the seeds you deliberately planted? I’m guessing “no” since it remained a mystery plant for so long. In view of its size and toxicity, I think I’d eliminate it although I do see where a swath of those flower heads as a back of a border plant would be very attractive.